This is a guide about making snowman gourds. Easy to make with dried gourds, and can be used as winter or Christmas decorations. These guys are so easy to make and can be used as Christmas decorations, or as place setting for your dinner guest. Easy, and so cute! Model into arm and leg shapes. Roll arms and legs like snakes and shape to the gourd. Bake arms and legs at 300 degrees Fahrenheit until they harden. (DO NOT BAKE GOURD) Let them cool. 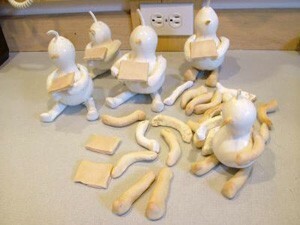 Glue the arms and legs to gourd. Use pen for face and if you want give gourd pink cheeks. Cut scraps for scarf and hat. Just form square rectangles out of the dough and bake then paint with bright colors, the name of your guest and glitter. Then, when the dinner is over give to your guest as a homemade present. 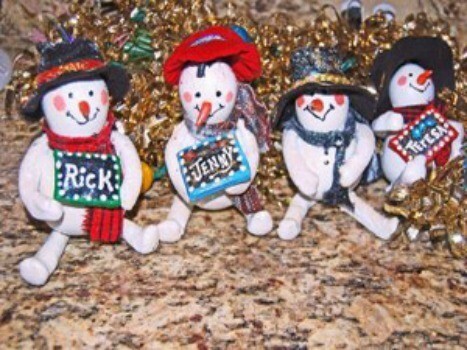 These guys can be used as Christmas decorations or place setting for dinner guest. Very nice. Very original too. My old stomping grounds! I went to 9th grade there and still have friends in Stanwood. I love the idea. Very cute!